From “beast of burden” to “beast of fortune”: that’s how the carabao has evolved after centuries of neglect, the threat of extinction, the low regard in which it is held, and playing second fiddle to farm machines. Despite being replaced in some of the most important farm tasks by small farm machinery, the carabao has not only made a successful comeback but has also become more significant to millions of farmers, changing people’s lives and being the center for vibrant carabao-based enterprises, thanks to the unflagging efforts of Filipino scientists, a government which worked hard for its upgrading, and the men and women who are continuously working for its welfare. 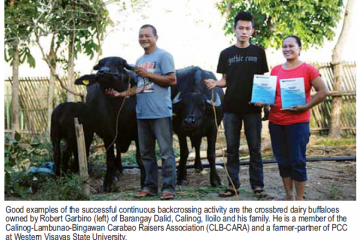 “Over the years, we didn’t see the contribution of the [carabao to] local dairy production. But now, their contribution is 34% and [this figure continues to increase],” said Dr. Arneldel Barrio, acting Philippine Carabao Center (PCC) executive director. The flow of milk comes from the upgrading of carabaos from the draft type to the dairy breed type Take the case of Andypoe Garcia, a farmer in Sitio Mapiña, Magalang, Pampanga who collected 14 liters of milk a day for three months from his crossbred carabao during the peak period and seven to eight liters during the rest of the 10-month lactation period. He has more than 20 other dairy carabaos, although their production averages a little less than that of his prized carabao. He sells the milk to a sweets and pastries establishment in Angeles City for Php80 per liter. And there’s dairy farmer Francisco Solis in Gen. Trias, Cavite, who used to deliver the milk yield from his dairy animals using an owner-type jeep. Today he still carries out the same chore—this time, using a van that cost seven figures. Solis, who was once a dirt-poor farmer, used the money raised from his wedding gifts to buy one carabao in 1991. Over time, he built a herd of 23 dairy carabaos—and a fortune that has so far enabled him to acquire four passenger jeepneys, an L-200 van, tricycles, hand tractors, threshers, a store, and a bakery. In San Jose City, Melchor Correa earns Php2,500 a day after milking his six carabaos twice. Correa heads a dairy cooperative that produces various milk products for sale to the public. More than 50 dairy carabao cooperatives banded themselves into the “Nueva Ecija Federation of Dairy Carabao Cooperatives” (NEFEDCCO), which runs a milk processing plant in Talavera, Nueva Ecija. The plant earns a handsome annual income from the processing of the milk turned in by its member-coops into various milk products. In most areas, the carabao’s milk has an ex-farmgate price of Php50 to 60 a liter. “In terms of carabao meat, our carabao slaughter rate was formerly 11-12%, but [this] has gone up to 16%. 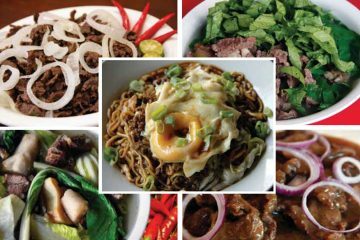 On the other hand, the importation [of carabao meat] is not increasing, although the demand [for it] is increasing, and that means it is another big contribution of the [carabao] to the country’s economy,” said Del Barrio. He said a number of bigger projects to firm up the rise of the carabao as source for varied fortunes are being pursued by the PCC. One of these is the implementation of the multiplier farm concept, in which 50 quality dairy carabaos are provided to qualified individuals or groups to further promote the advancement of the carabao development program. “Under the agreement, these farms will provide all the inputs [for] tending the animals and [will turn over] thefirst offspring to the PCC. They are expected to put up viable enterprises from the milk they will collect from the animals and from [their] other offspring…” del Barrio said. The first such farm has already been established in Javier town in Leyte—the second in a Tarlac town. Another project being pursued is the establishment of dairy carabao hubs in various parts of the country. These hubs, he said, comprise a well-oiled business chain involving the provision of credit, forage production, breeding, product development, promotion, marketing, and other aspects related to a robust dairy carabao business. “For one, a forage industry for dairy carabaos must get going. We know that…dairy carabaos can [produce much] milk if they are fed well. As you can see, the farmers have limited resources [and may not have access to an] abundant supply of nutritional feed,” del Barrio pointed out. Nonetheless, he has a positive outlook. 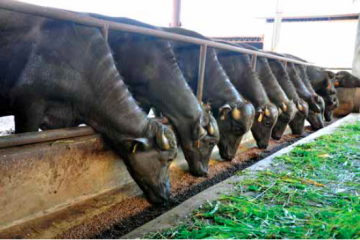 “The day is not too far when we shall have produced our Philippine Dairy Buffalo breed which is comparable to the best water buffalo [breeds] in the world.” It is envisioned to be a “three-in-one” carabao, providing milk, meat, and draft power. This animal, according to published archeological findings, was domesticated some 7,000 years ago in the Chekiang province of China. It was of two types – the swamp buffalo and the riverine buffalo. Both types are distinct yet share similar descriptions and characteristics. Their body anatomy is generally the same but their chromosomes differ – the riverine type with 50 and the swamp type, 48. The riverine-type has a black body color and has a curled horn while the swamp type is dark gray, with horns that extend outward and curl backwards into a semi-circle. It was the swamp type which was brought to the country; it is naturally excellent as a draft creature. The riverine type, like those found in India, Pakistan, and in the Mediterranean areas, is considered best for meat and milk. On Philippine soil, the swamp type earned the unique name “carabao.” Recent studies on the lineage of the Philippine carabao indicated that it descended from the maternal line of the Chinese buffaloes. The name is surmised to have come from the Visayan or Cebuano word “karabaw” which was apparently derived from “kerbau,” the Malaysian and Indonesian local name for the water buffalo. The same study estimates that about 66 percent of the Philippine population used the carabao for farm work, Cruz added. In the early 1900s, diseases—particularly rinderpest—swept through the animal’s population. At the same time, a locust infestation damaged the vegetation that fed the carabao, resulting in a poor supply of feed for the animal. Almost 90 percent of its population was wiped out because of the disease and the insect infestation. The locust infestation was viewed with alarm by foreign entities worrying about the economy and stability of the country. It became a prominent story in the New York Times in the latter part of 1902, with these headlines and subheads: Dearth of Field Animals; Pest has Almost Exterminated Carabaos in the Philippines; Agriculture at a Standstill. 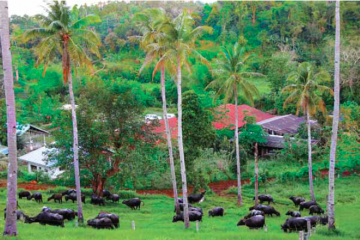 But like the resilient people and nation that we are, life moved on for the carabao. In time, its population increased. During the last World War, however, another catastrophe affected the carabao. Japanese officials suspected that the carabao was being used by the Filipino guerrillas for transporting weapons and goods in aiding American soldiers. The massacre of the carabao was ordered. All told, about two million were killed. Their breed, too, suffered due to the lack of knowledge of proper animal husbandry techniques. “The farmers, wanting to have bigger and sturdier animals, usually castrated the best of their bulls. As a result, lesser quality bulls were left for mating and for the propagation of their species,” Cruz said. 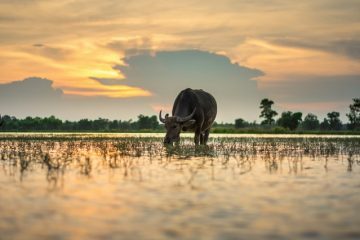 The lack of knowledge among the farmers extended to the carabao’s nutritional needs and healthcare, so their offspring declined in size and weight—as did their draft power. Significant developments took place in the last 42 years that eventually catapulted the carabao to new heights. Filipino scientists took up the cudgels for the improvement of the breed and passing on the proper care techniques for carabaos. Then the Philippine legislature passed a unique law that gave prominent attention to the carabao’s improvement and propagation. 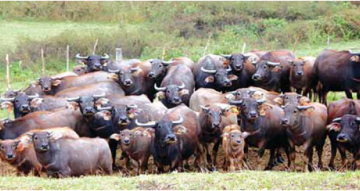 From including a study on the carabao’s breed, population, and health under beef-chevon research and development studies, bigger concerns about the animal were raised. “That was in 1973 when the then Philippine Council for Agricultural Resources Research (PCARR) undertook that step,” said Dr. Patricio Faylon, former executive director of the council, in his published account about the carabao’s development in the country. 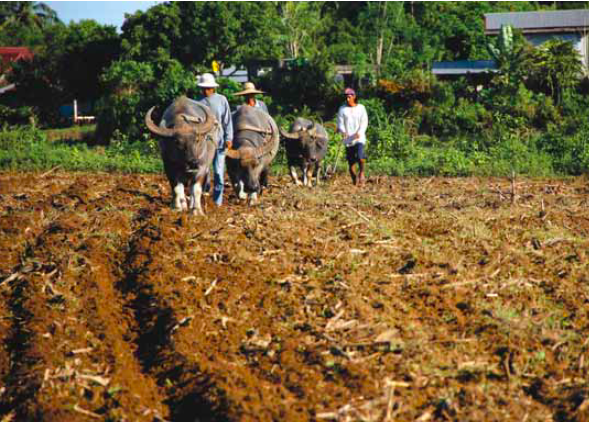 Three years later, a Carabao Commodity Team was formed by PCARR and was allotted funds for its R&D efforts. Then in 1981, with a funding provided by the Food and Agriculture Organization-United Nations Development Program (FAO-UNDP), the “Strengthening of the Philippine Carabao Research and Development Center” was implemented. The center, among others, was meant to strengthen institutional capabilities in the testing of the performance of crossbreds, which are the offspring of the crossing of the dairy-type buffalos with those of the native carabao. • Murrah buffalo and Philippine carabao crosses (50:50) have relatively greater capacity to grow and produce milk than the native carabao. • At 24 months, the crossbred weighed 216.46 kilograms (kg), or 28 percent more than the native carabao. • In terms of draftablity, there is no difference in performance between the native carabaos and Murrah grades, suggesting that the introduction of Murrah blood to improve the milk production does not have a detrimental effect on the ability of the animal to perform work. • Some crossbred calves were observed to weigh about 34 kg at birth, with females averaging 26.65 kg. On the other hand, the male native carabao calves weighed an average of 23.54 kg at birth, with the females at 23.42 kg. • Some mature crossbreds weighed 700 kg, with the females showing the potential for 10-12 liters of milk production per day. On March 27, 1993 the PCC was officially created as an attached agency of the Department of Agriculture. It then embarked on a program to upgrade the farmers’ native carabaos through artificial insemination (AI), a bull loan program, and other modern reproductive biotechnologies. “Your country has developed a unique water buffalo, a three-in-one carabao. It produces more milk, it’s heavier and meatier, and it still retains its draft ability,” said Dr. Surendra Ranjhan, a former FAO consultant and chief technical adviser of the UNDP, during an interview when he visited PCC in 2014. The economic life of the farmers raising dairy carabaos has also improved a lot, Ranjhan added. “They not only vastly improved their houses, bought farm machines and motorcycles, but were able to send their children to college,” he said.